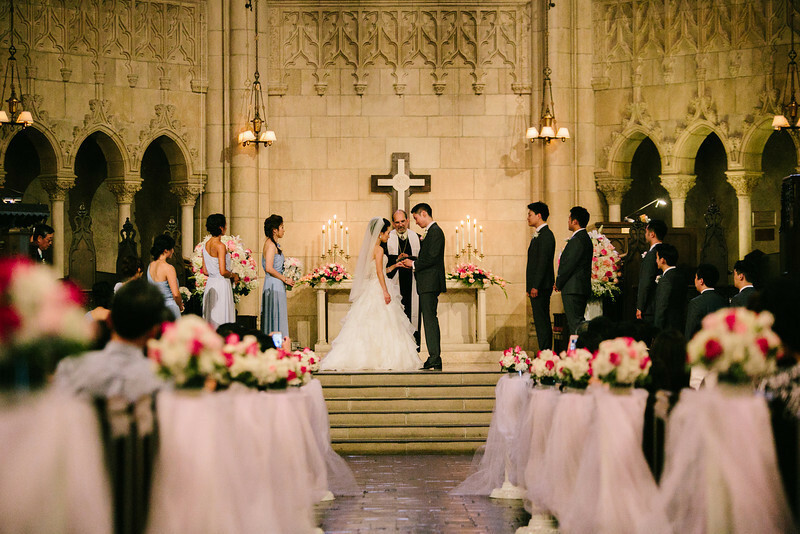 Westminster’s majestic French Gothic Cathedral is the choice of many couples for their marriage ceremony. At Westminster, a wedding is a beautiful worship celebration where two people unite their lives in God’s presence. The joyous celebration of this union in our sanctuary is open to all who seriously desire it. Non-member weddings are part of our ministry. If the bride and groom are active members of another church, Westminster welcomes the participation of their clergy alongside our own as part of our ministry and mission. Inquiries regarding wedding dates and times as well as receptions and other facility usages may be made by calling 626.794.7141 or emailing the Church Administrator at info@wpcpas.org. Make your day memorable in this magnificent venue. No use of rice, confetti, or birdseed.No flash photography during the service. No flash photography during the service. Video cameras must be unobtrusive and stationary. Aisle runners are not allowed due to safety/insurance concerns. Wine and champagne are the only alcohol allowed for receptions. For weddings between Thanksgiving and New Year’s our sanctuary is decorated for Christmas. Our weddings are booked in 3-hour time slots. There are 4 slots on Saturdays. We only book one wedding on Sunday so the start of the 3-hour block is more flexible. Week day weddings are available upon request. Rehearsals are generally an hour long and take place Thursday evening. Westminster provides an organist for each wedding service held in the Sanctuary. We have a piano, harpsichord and organ. The organist usually rehearses with any soloist(s) one hour before the scheduled start of the wedding service. Other musicians (vocal and/or instrumental) may be incorporated into the wedding service. Participation of other musicians should be arranged in cooperation with the wedding coordinator. Westminster’s wedding coordinators can suggest many appropriate musical selections. Westminster’s wedding coordinators assist in the planning and completion of each wedding service. Beginning with a consultation 4-6 weeks prior to the wedding, coordinators help with a wide variety of details from the planning stages of the service to the rehearsal to the final photographs after the ceremony. As church staff members, Wedding Coordinators, in consultation with the pastor, represent the “final word” on what is appropriate for Westminster’s sanctuary. Westminster provides a reflective, interactive, and comprehensive course of premarital counseling to all couples to be married at its facility. The five-session course reviews concerns common to most couples entering marriage. Professional, caring members of Westminster’s staff lead couples in each of the private 50-minute sessions. Sessions 1 & 5 are held with one of Westminster’s pastors and Sessions 2, 3, & 4 are held with a member of the Westminster Counseling Center staff. A certificate of completion is provided to each couple at the end of the course. Westminster provides dressing rooms for both the bride and the groom. The church facilities are available to the wedding party from the beginning of the wedding time block until the start of the service. The church is not responsible for lost or stolen items. Westminster is equipped to host receptions of up to 300 guests in Morrison Hall. Chairs and tables, a full stage, the use of the kitchenette and a simple, portable PA system are included in the standard cost. For an additional fee, as many as 400 guests and decoration time on Friday night may be accommodated. Custodial services and a reception coordinator are also provided. For an additional fee, Westminster’s commercial kitchen is also available. Receptions may be booked through the Church Administrator. Inquiries regarding wedding dates and times as well as receptions and other facility usages may be made by calling 626.794.7141 or emailing the Church Administrator at info@wpcpas.org. We are happy to show you around our facilities. Visit our office during the week from 9 – 4 and someone can show you pictures of previous weddings and receptions as well as take you on a tour through our facilities.